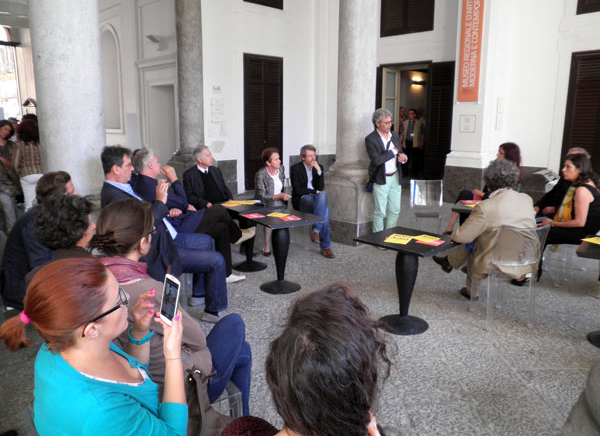 Francesca Arras (Tamalacà); Stefano Cucca (Rumundu Social Innovation School); Domenico D’;Orsogna (Università di Sassari / Decamaster); Massimo Faiferri (Università di Sassari / Dadu); Elda Felluga (Livio Felluga / Vigne Museum); Fabrice Hyber (artista); Franco Carta (Fondazione Banco di Sardegna); Antonio Solinas (Abinsula); Donatella Spaziani (artista); Dora Stiefelmeier (RAM radioartemobile / Fondazione No Man’s Land) Modera: Giovanna Felluga (D/A/C, AtemporaryStudio). 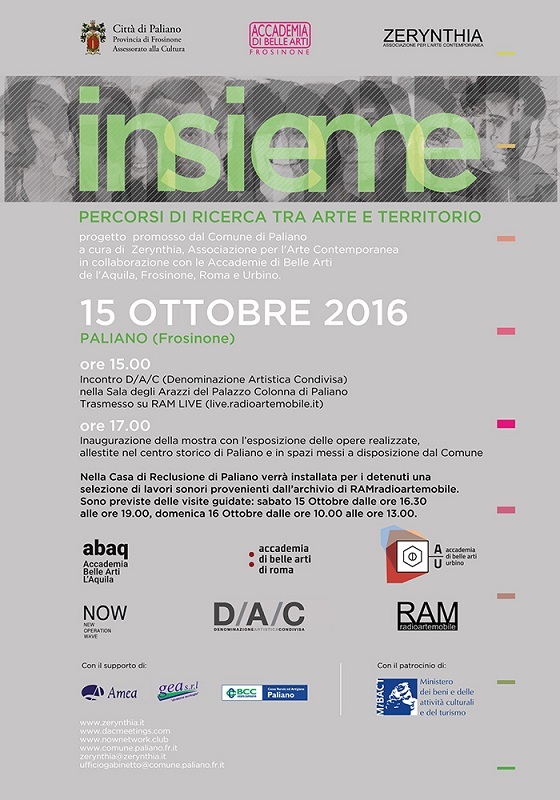 The Paliano Town Council presents INSIEME (TOGETHER), curated by Zerynthia, an innovative educational project involving the Fine Art Academies of L’Aquila, Frosinone, Roma and Urbino for the development of a venture linked to the area of the Municipality. Last July, the tutors of the participating Academies selected a few students, chosen for their study paths concentrating on the relationship between art and territory. After two visits to get to know the town and territory of Paliano, the group of participants will be accommodated by the Council for a residency of three days during which they will be able to prepare and put together their projects, all of which strictly site-specific. 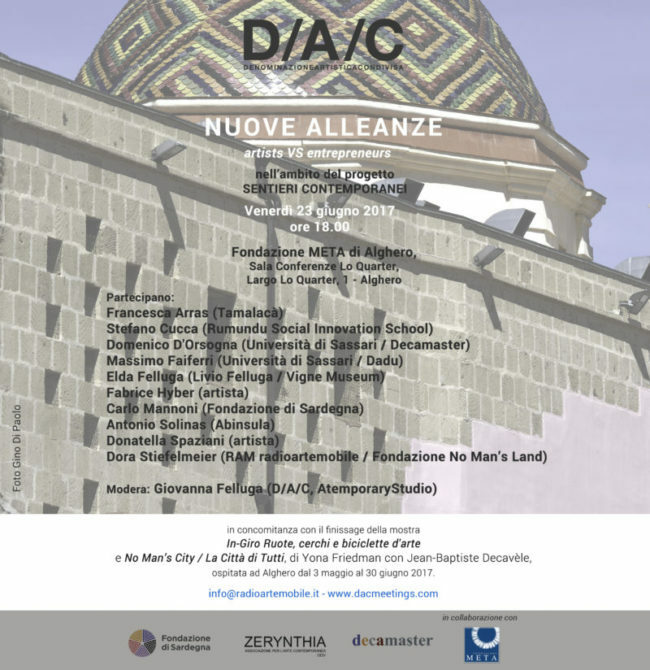 On Saturday 15th October 2016 at 15.00 in the Tapestry Room of the Palazzo Colonna is held D/A/C 18 meeting entitled: L’arte contemporanea per la valorizzazione del territorio (Contemporary Art for the valorisation of the territory), involving the participation of artists and curators alongside businessmen and administrators both public and private from the Frosinone Province. 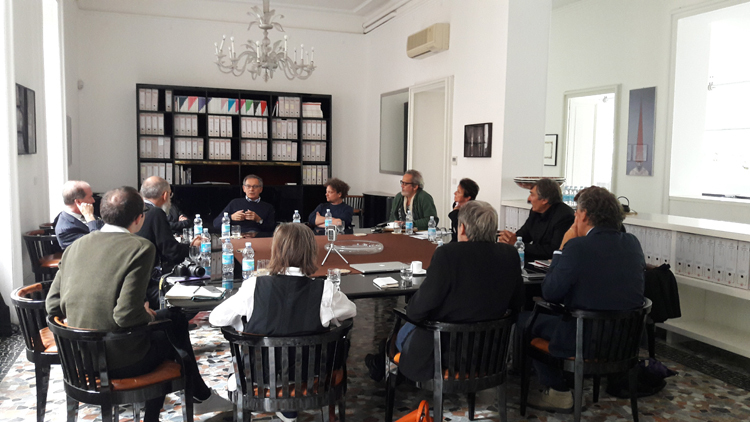 This meeting includes in the programme of D/A/C – which considers artistic creativity a catalyst for productive processes and human relations – following the meeting on 30th September 2016 at the Antonio Ratti Foundation in Como. 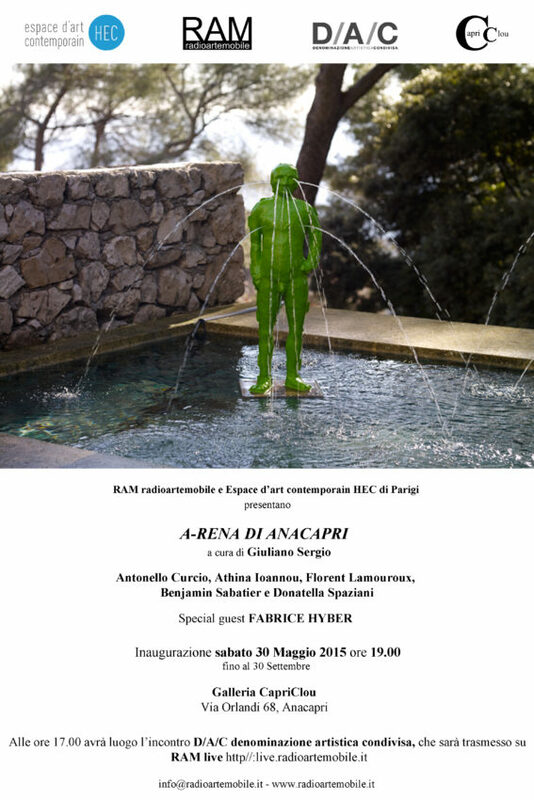 The Anacapri A-rena is an adventure which was born in Paris, at the Espace d’art contemporain HEC, when Mario and Dora Pieroni from RAM radioartemobile, together with Anne-Valérie Delval, brought together artists, critics and businessmen around a table to reflect on the possibilities of dialogue between art and business. 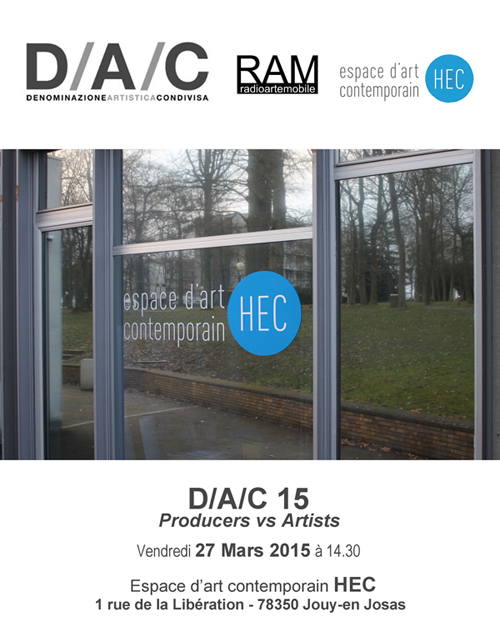 For years the D/A/C (Shared Artistic Denomination) meetings have proposed the idea that it is necessary to construct a network of relations, to find alternative ways to open up to the world of business, something that often means being surprised by the dynamics of production, by the logic of the market, by the risk of associations. Today, after that meeting, six artists exhibit in a communal space with works born from commissions within the world of industry. These are works attempting to “slip” away from current practices, in order to bypass an ever more monolithic artistic model, a system of contemporary art that tends towards conforming modalities of production and reception. The meeting with industries is, as such, not only “useful” but “essential” – for artists and businessmen alike – as it offers a miraculously free space for research, a place in which to lose the distinction between subject and product and to rethink art as a mere relationship, system, game. It is this inclination that runs through the works on show. First, Fabrice Hyber, who with his POFs (Prototypes d’Objets en Fonctionnement) reinvents the forms and functions of everyday objects. Hyber even set up an association, UR (Unlimited Responsibility), to produce his pieces and those of other artists, but above all to bring art into the universe of consumption, demystifying it with the power of his irony: “POFs are openings,” he explains, “possibilities”. This is the responsibility that the artist takes on, allowing him to have a vital function in society. In this direction, Donatella Spaziani sees industrial and artisanal production as an aesthetic space, a process in which to graft her own intervention, not to “adorn” or “embellish” it, but to modify the finality and results of the fabrication, marking an existential presence living inside the produced object: as such the body becomes a measurement, a template that appears in a domestic space, on the walls, on the tiles and, at the same time, that constitutes the form moulding the seats and mattresses projected. Athina Ioannou, on the other hand, considers the artist himself as a business, the pictorial work of whom begins with the design of an element – in this case a table – that then spreads over and polarises the space, investing it with a rhythm of light and colour modules. Antonello Curcio uses industrial techniques to create pictorial quotations transferred onto Toile de Jouy tablecloths, while Florent Lamouroux is concerned with the symbols of fabrication: his works are a “supplementary production of industry”, where the gestures, uniforms and objects become icons with which the artists measures himself. Lastly, Benjamin Sabatier creates predefined systems inviting the public to produce artwork by following the given rules. His research quotes experiences that have marked the relationships between industry and artists and that today can be reread with full awareness. What does Capri have to do with all this? A lot, when one thinks of its role as a “free port”, as an international showcase that for thousands of years has been the stage for the extravagances of power. In Capri these objects, far from the factories and museums, find verification amid the neoclassical echoes of the garden of Federico Guiscardo, a small arena in which to measure the irony of the swings and fountains, masks, tables and pavings, in one of the most playful places ever. 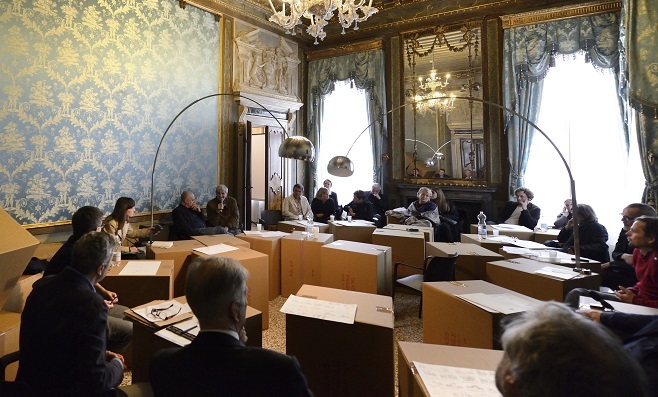 The 31st of May at 17.30, in the internal courtyard of the Palazzo Riso, on the occasion of the opening of the exhibition “Stanze #1” (“Rooms #1”), presenting works by Giovanni Anselmo and Jannis Kounellis, the DAC XII round table entitled the Enterprise of Art, is held by Valeria Li Vigni, director of the Riso, Contemporary Art Museum of Sicily, Giovanni Iovane, curator of the exhibition, Lorenzo Benedetti, Paolo Falcone, Giuseppe Forello, Massimiliano Fragalà, Mario Pieroni, Antonio Presti, Ferdinando Vicentini Orgnani and Dora Stiefelmeier. Following this, the screening of the documentary Senza Titolo (Untitled) by Ferdinando Vicentini Orgnani. On January 30th at 18.00 at the Hotel Hassler in Rome RAM radioartemobile promoted and organized the round table entitled PRODUCERS vs ARTISTS. Around this table conceived and created for the occasion by Fabrice Hyber, artists Gianfranco Baruchello, Yona Friedman (with a pre-recorded intervention) & Jean-Baptiste Decavèle and Fabrice Hyber, boasting multiple experiences of artistic ‘interference’ in various areas of both civil and entrepreneurial life, met businessmen Ovidio Jacorossi President of FINTERMICA 2 SPA, Rome, Marcello Zaccagnini Sole Administrator of the Zaccagnini wineries in Bolognano and the oenologist Alessia Antinori from the Marchesi Antinori wineries in Florence. The debate was moderated by Chiara Parisi, Director of cultural programs at La Monnaie, Paris. 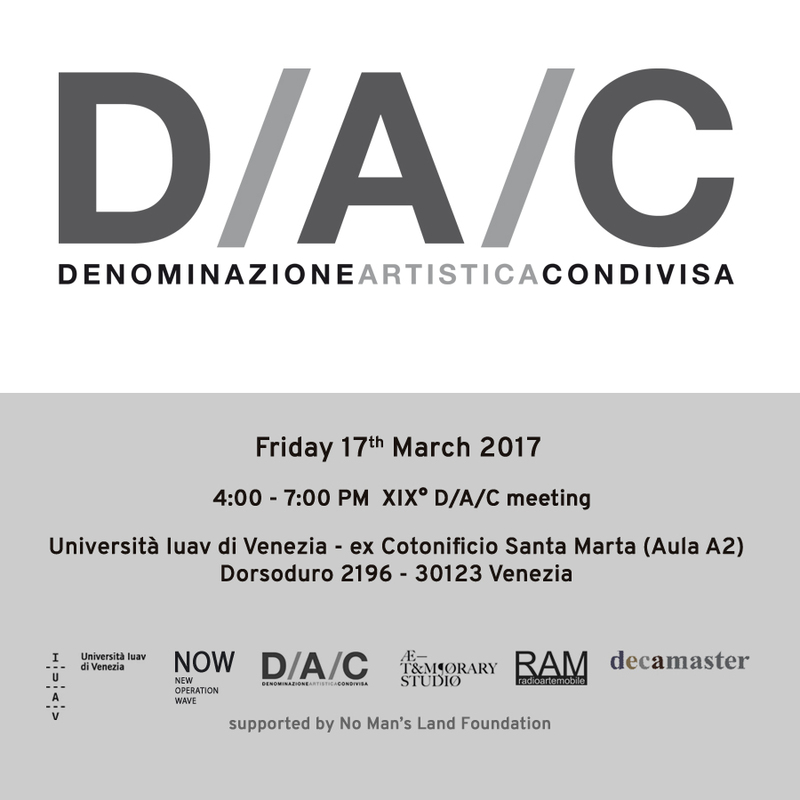 For the occasion RAM created and presented a preview of the registered trademark D/A/C aimed at creating a dialogue between different ways of seeing the product, a Shared Artistic Denomination (Denominazione Artistica Condivisa). The artists present at the debate are proposed as “idea sponsors”, turning the traditional role between art and business on its head and overcoming the concept of the sponsor as nothing more than the mere presumption of profit in terms of image. With their creativity the artists can give added value to the business. As stated by Gianfranco Baruchello, the artist offers his or her language born from the territory of uncertainty and open possibilities and can give the business the impetus and courage to rise out of these fixed concepts and accept a parallel thought to the dominating economic one. Alongside the intelligence of the producer a parallel intelligence can co-exist that includes dreams and imagination. Fabrice Hyber evoked his experiences in certain companies where he was able to produce totally new conducts. Jean Baptiste Decavèle wished to give a specific form to this change, born as always from improvisation, a statement that was in turn confirmed by Yona Friedman in the wonderful recording made for the round table in which he described his mobile architecture – light, environmentally friendly and determined by the user – hoping for an architecture free from sponsors, closer to art. Ovidio Jacorossi declared that for him contemporary art has for years constituted a continuous solicitude, affirming that it is impossible to bring contemporary art to the world of business if the company does not place man at the centre. He underlined the need of strong interventions in this moment of crisis and insisted also on the role of the gallery owners as mediating figures in the encounter between artists and businessmen. 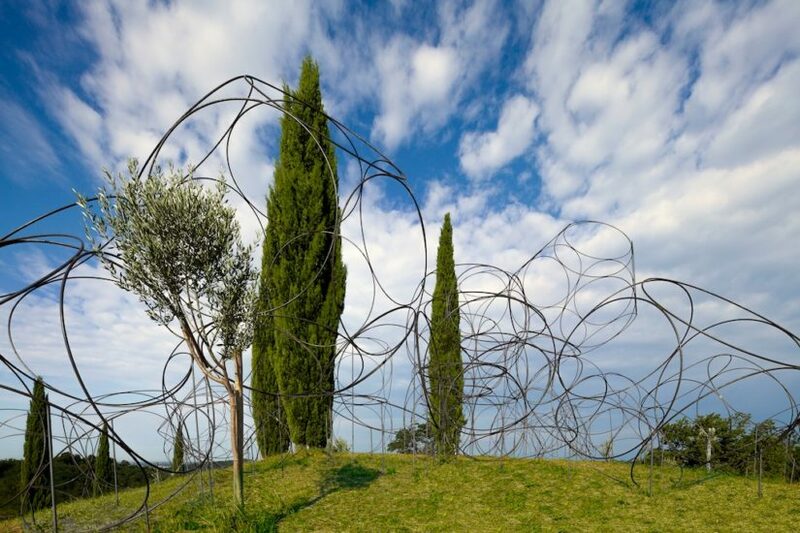 Alessia Antinori highlighted the link between her company, the art that for centuries has been linked to the production of the wineries and the territory, including the landscape in the communicative business strategy. Marcello Zaccagnini told of how he was contaminated by the world of art through a performance by Joseph Beuys in his winery in the early eighties. 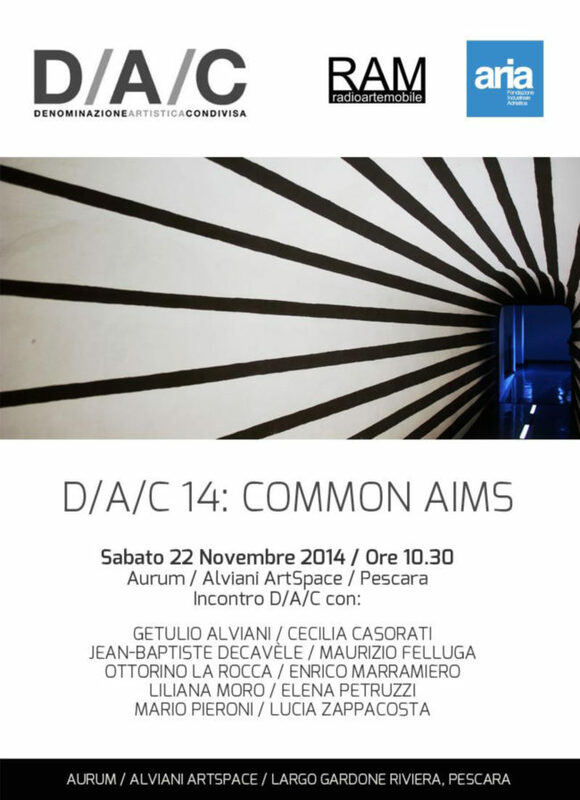 Further interventions were made by Massimo Sterpi, lawyer and President of the Bar Association Contemporary Art Committee, who cast doubts on business collection that risks ending up collecting corpses, and Simonetta Lux, Professor of contemporary art at the Sapienza University of Rome, with a nice testimony to company artistic interference. As mentioned in conclusion by Baruchello, artists offer the imperceptible, a dust cloud of ideas and it is up to the businesses to act as magnets to attract it. From this was born not only the desire to meet again but to formalise this first round table by founding a MOBILE CLUB, of which artists and businessmen alike are members, with the common goal of sharing creativity and productive processes.